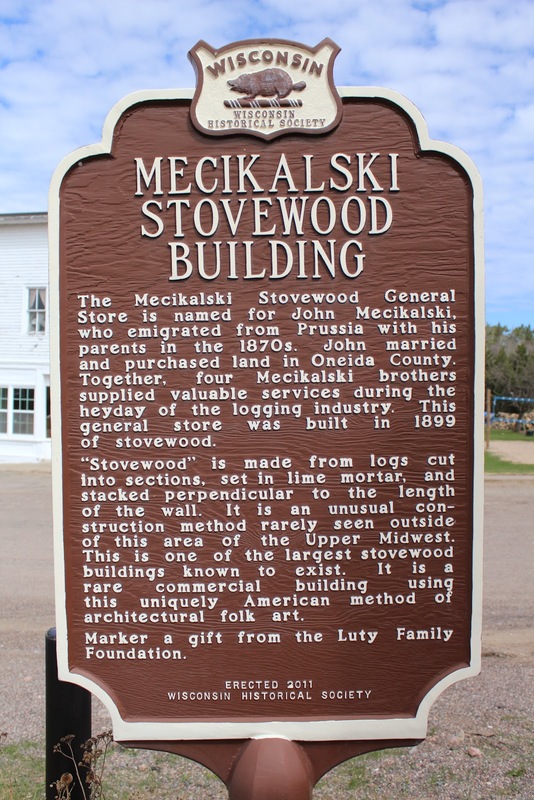 The Mecikalski Stovewood General Store is named for John Mecikalski, who emigrated from Prussia with his parents in the 1870s. John married and purchased land in Oneida County. Together, four Mecikalski brothers supplied valuable services during the heyday of the logging industry. This general store was built in 1899 of stovewood. “Stovewood” is made from logs cut into sections, set in lime mortar, and stacked perpendicular to the length of the wall. It is an unusual construction method rarely seen outside of this area of the Upper Midwest. This is one of the largest stovewood buildings known to exist. It is a rare commercial building using this uniquely American method of architectural folk art. Marker a gift from the Luty Family Foundation. The marker is located on eastbound Max Road, on the southeast corner of its intersection with County Road B and County Road C, Pelican Lake, Wisconsin 54463. 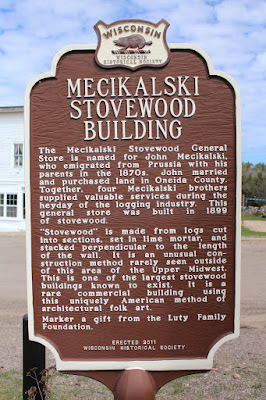 MECIKALSKI STOVEWOOD BUILDING - Circa 1899 - National Historical Site. Open Memorial Day to Labor Day. The Mecikalski Stovewood Building is a unique historical structure with great architectural significance. Built at the turn of the century, it represents a fine example of rare "stovewood" construction and is the only known commerical building utilizing the stovewood building method. Located 4 miles east of Hwy 45, Pelican Lake. Corner B & Z. This photo of the building is inside the store. Looking west along County Highway B. Looking east along Max Road. Nearby sign point the way to the Mecikalski Stovewood Building. Cold and snowing on the day of my first visit . . . Easter Sunday 2013!